Kathy Robbins has an artist’s heart. 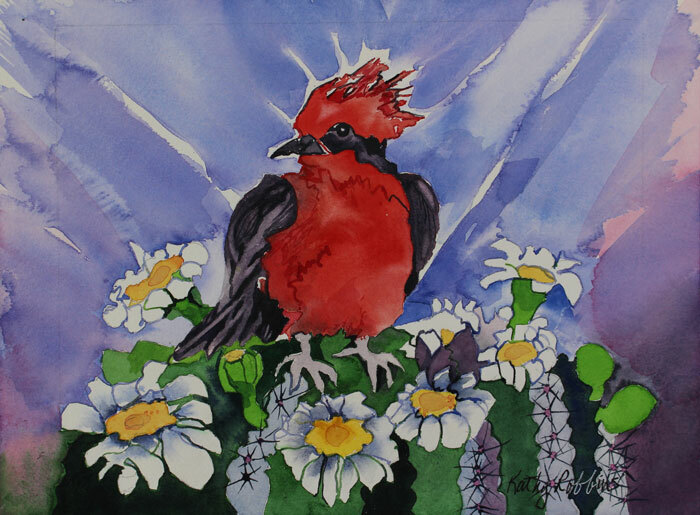 Born to an artist mother, she was continually encouraged and inspired from infancy on. She remembers that an important part of her early childhood was spent sitting at her Dad’s big desk and drawing. Kathy would draw girls and boys dressed in her concept of the costumes they would wear in their countries of origin. By the time she entered grade school, her art abilities had developed to the extent that her classmates would copy her in art classes. She enjoys painting alone where she can go into a “zone” of deep concentration and total involvement with her chosen image. It sends her to a happy place that excites and invigorates. Often she paints local landscapes where she can incorporate the colors she loves. 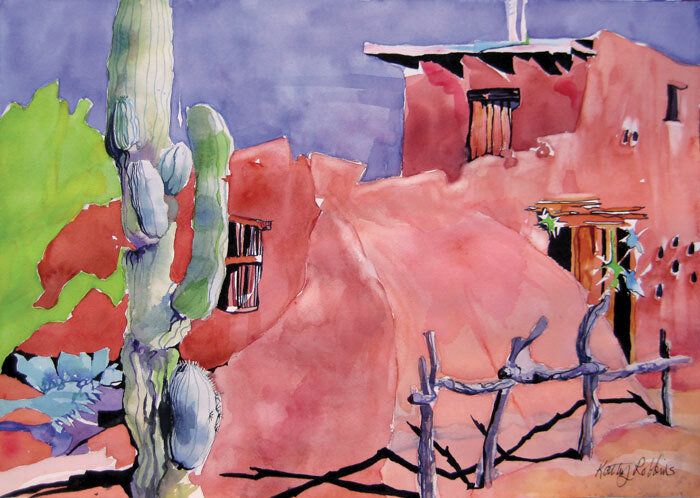 Big favorites are a lime green, a bluish-purple and a peachy, pinkish-orange that her artist friends refer to as “Kathy’s Colors”. Ideas strike her when she is inspired by an image that just calls out to be painted. Along with being captivated by the natural design in all of nature and her love of the desert, she is attracted to local architecture and especially to tropical Mexican images. Perhaps she is drawn to the latter because her dad was Mexican with roots in Oaxaca, Mexico. 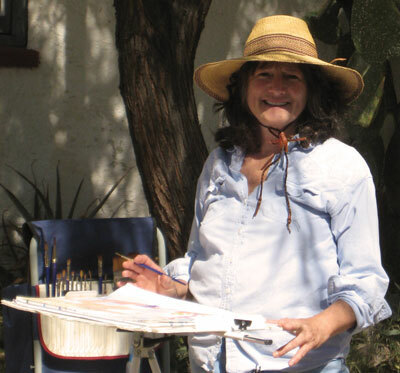 Kathy’s preferred method of working is to begin a painting in a Plein Air setting. She then takes photographs of the image area. Later, working from these photos, she completes the painting in her studio— a made-over bedroom with a window for good light, a 6-foot table, and good storage space. She feels composition is very important in producing a successful painting and often does one or more pencil drawings before actually beginning the painting. 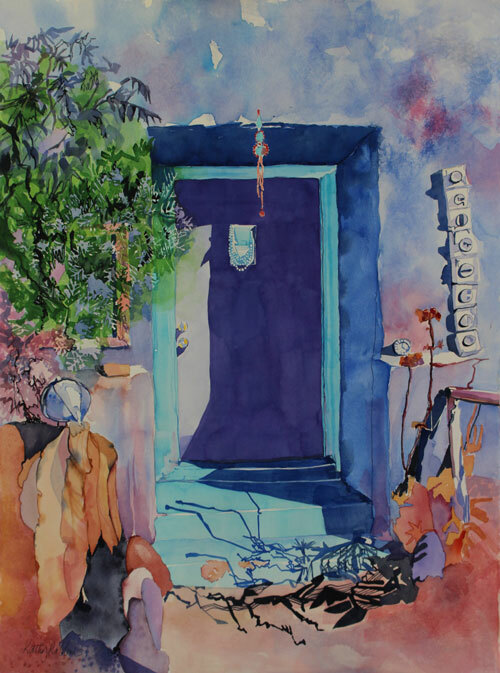 All of her work is done free-hand and she considers herself a purist in the use of watercolor pigments. She prefers the transparent colors and saves the whites of her paper rather than using a more opaque white paint to produce white areas. Thus her paintings display a strong vibrancy. Kathy feels that the most seminal experience she has had in her art journey was the discovery of pigment after many years of drawing. 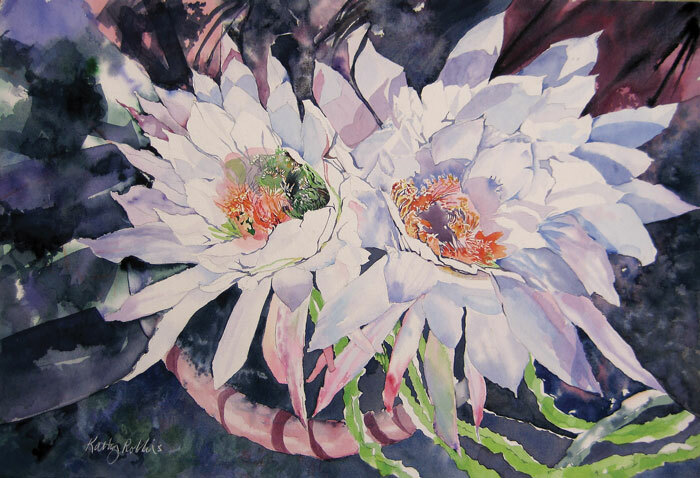 She began with the medium of Oils and, when she moved to Tucson, she felt drawn to Watercolors. This medium was, for her, easier to handle than the Oils she had been working with. But both Oils and Watercolors opened her to the wonderful world of color. After earning a Fine Arts Degree from the University of Wisconsin, Kathy pursued a job in the large recycling arena in Wisconsin. But, as she worked, she was ever vigilant for finding art classes and workshops where she could further her knowledge and increase her skills in her art. Kathy and Mitchell have been married for 45 years and he is a staunch supporter of her artistic endeavors. Since college days he has helped in more ways than she can think of including hauling countless paintings to shows and back, helping hang shows and even critiquing her work. Their two sons also take pride in her work providing her with great family support. An achievement that Kathy feels is one of her finest is the illustrating of a children’s book, “Peep, the Cactus Dragon” by local writer Don Collins. It contains 30 pages of original watercolors, for which she did a good deal of research. It has been a valuable lesson to this day.